Why is the witty, funny Brian never shown? "When Brian was 'on' he had an amazing sense of humour, and when Brian would come into the room with the four Beatles it was Brian who was the star. He would light up the room. He was very good-looking, very well dressed and had this infectious smile. He was filled with witticisms and he could be very funny … and when he started to get funny he became outrageously funny. He was such an iconoclast and nothing was sacred to him... "
I also have found similar quotes from others, such as Derek Taylor and (unrelated) Alistair Taylor. 1. Why do you think there is so little written, and no footage (that I'm aware of, anyway), of Brian being such a funny person? Every actor who's ever played him depicts him as being a perfect gentleman, yet so very... un-funny. Nothing showing what a great sense of humour he was said to have exhibited. 2. Therefore, do you think all past portrayals of Epstein have therefore been faulty or, at the very least, incomplete? 3. What could or should be done to remedy this, if anything? And, could it be that he was like that only when he was "alone", with friends or other intimate people? Maybe no one really knew about his private side. I wish I knew him personally. I hate having to stick to what other people write about him. You mention: I hate having to stick to what other people write about him. Yes, especially when all they write is either the melancholy stuff ~ or worse, the sexual stuff. Balance it out, people. Make him a real person. You can't tell me that funny anecdotes wouldn't sell...! If that were true, then all the clowning and witty banter by his Boys would have had no effect. However, their humour was a big, big part of Beatlemania! Just knowing what we know about the collective intelligence of the Beatles...and what we've heard about Brian and the way he ran the NEMS music department and how ahead of the curve/trends he was...you can imagine how charming and funny and fun he was in person...Lennon's love of The Goons...the puns...the literate nature of the "fabs" _the humor that they used to charm the press---it all adds up to one easy conclusion----that in order for Brian to become as trusted and loved by the band (as well as the boss) as he was he must have had an absolutely incredible personality and that included wit, savvy, humor and most of all...brains. This man was the smartest Beatle. ~ and I do hope the movie people are paying attention. One thing I've always wished was that somebody in Brian's inner circle could explain, thoroughly and exactly, how Eppy acted with his closest friends when he was being wickedly hilarious ~ try to show similar examples if they could ~ ? Anyway, at the end of that interview (which was mostly about his new book A Cellarful of Noise), John was obnoxious, interrupting with some sort of insane noises in the background ~ which made Brian's voice ALMOST erupt into a giggle. He managed to stifle himself just in time! Listening several times to that, and taken to its logical conclusion, I think Brian was a closet giggler! Gawd, I would have loved to have known him!!! Thanks for reiterating the fact that Brian was known to have a sense of HUMOR, Jim. ;D You hit it right on the head! What I would have given to see the Beatles in concert (as Eppylover has), or sit in on an Abbey Road session! Now; seeing the 'Boys' in a happy/sentimental moment with Brian would be one of my ultimate wishes. Yes; in terms of the movie people "paying attention," Eppylover, how bout Eppy's affair with Vera Brown? We both agree that her story is highly amusing: Debbie Geller's In My Life: The Brian Epstein Story pps. 40-41. 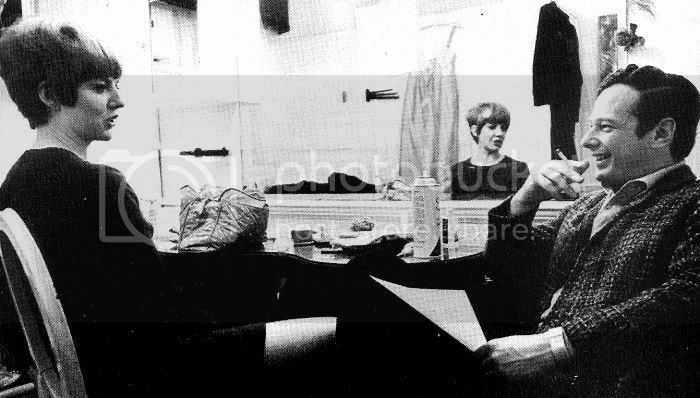 Don't forget that picture with Brian in the Beatle wig, and Paul looking on! You want HUMOR; there's proof!